Visual Studio 2013 has a new feature to take care of this. When you build the app, you should see warnings about different versions of an assembly being referenced. Double click the warning to add assembly binding redirects to the web.config. See http://msdn.microsoft.com/en-us/library/2fc472t2.aspx for more details. jeff.eynon notes below that you need to have the web.config checked out (if using TFS source control) to get VS to edit the file automatically. Thanks for the tip! I need this nuget package to implement PATCH using the Delta class (When I use the version 4.0.0.0 of the package, the Delta class is not working). Attempt by method 'System.Web.Http.GlobalConfiguration..cctor()' to access field 'System.Web.Http.GlobalConfiguration.CS$<>9__CachedAnonymousMethodDelegate2' failed. I guess that v 4.0.0.0 really need to be used by core Web Api engine. This error popped up several times on several different projects. What I finally figured out is that when I would build, there was already a copy of the system.web.mvc binary assembly in my bin folder. To fix this, right-click on the assembly in the list of references and select "properties". Check to see if this is the latest version by looking at the "Version" property. If it is, switch "Copy Local" to true. This will make sure that the version referenced in your project is the version that will end up in your binaries folder. If you still get the error, try running nuGet to get the latest version, then try the aforementioned again. Good luck - this error is a pain! i solve by way nuget. the first you install nuget. the second you use. third : Check to see if this is the latest version by looking at the "Version" property. The finaly : you check project have latest version again. After modifying the References in the Web.config file as mentioned above, we resolved the references. I was facing similar issue. After expanding reference, find the dll which caused the error. Right click on the dll reference and check for version like shown in the image above. 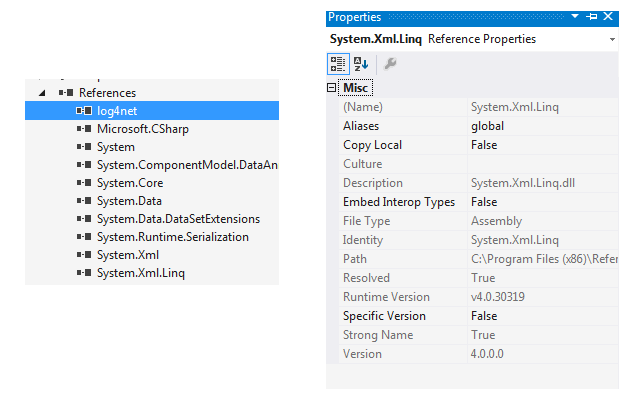 If both config dll version and referenced dll is different you would get this exception. Make sure both are of same version which would help.